Are you a fan of cabbage?! 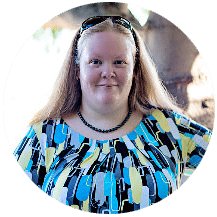 For the most part, I can take it or leave it, it’s just okay to me …. unless you’re talking about this Southern Bacon-Fried Cabbage. Goot Lort! I really believe that some of the most simple recipes are the best. Wouldn’t you agree? 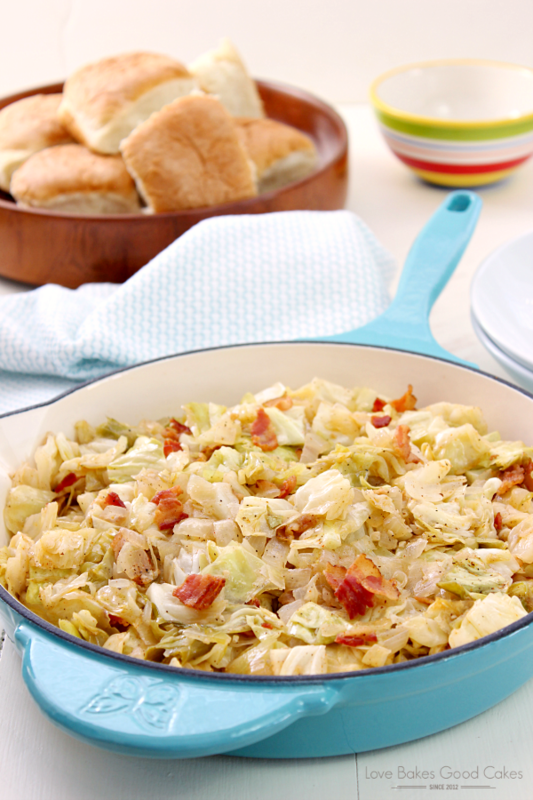 When it comes to this Southern Bacon-Fried Cabbage, I know it to be true! 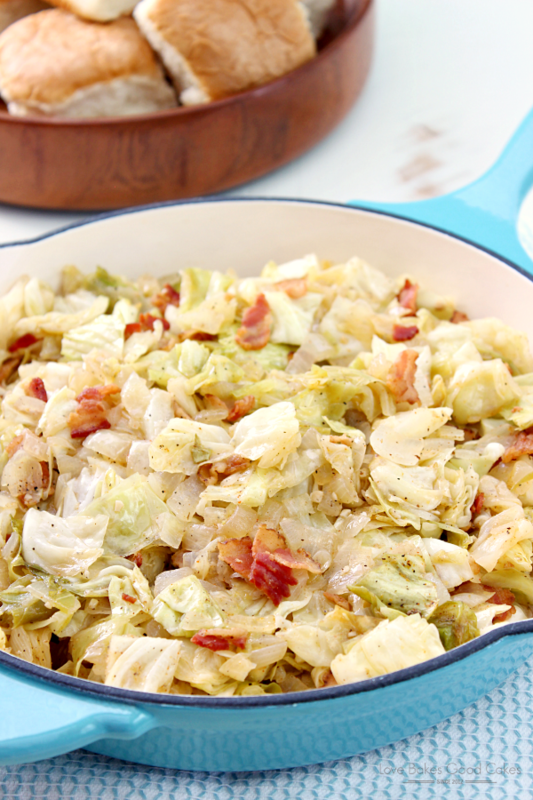 We’re talking four ingredients – cabbage, onion, garlic, and bacon … along with a few seasonings. Somehow, it cooks into this mesmerizing dish that I cannot stop eating! I could totally understand chocolate cake friends, but we’re talking about cabbage!! Cabbage!! Cook the bacon in a jumbo cooker over medium-high heat until crisp. Remove the bacon to a paper towel-lined plate. Reserve 2 tbsp. of the bacon grease and discard the rest. In the same jumbo cooker, return the 2 tbsp. bacon grease. Over medium-high heat, cook the onion until it is soft, about 4 minutes. Add the garlic and continue to cook for an additional 1 minute. Stir in the cabbage and continue to cook and stir for 4-5 minutes. Add the seasoned salt, pepper, onion powder and garlic powder. Mix well. Reduce heat to low, cover, and allow to simmer, stirring occasionally, for about 30 minutes. Just before serving, mix the bacon into the cooked cabbage. Serve immediately. For a more KETO-friendly meal, omit (or use less of) chopped onion. 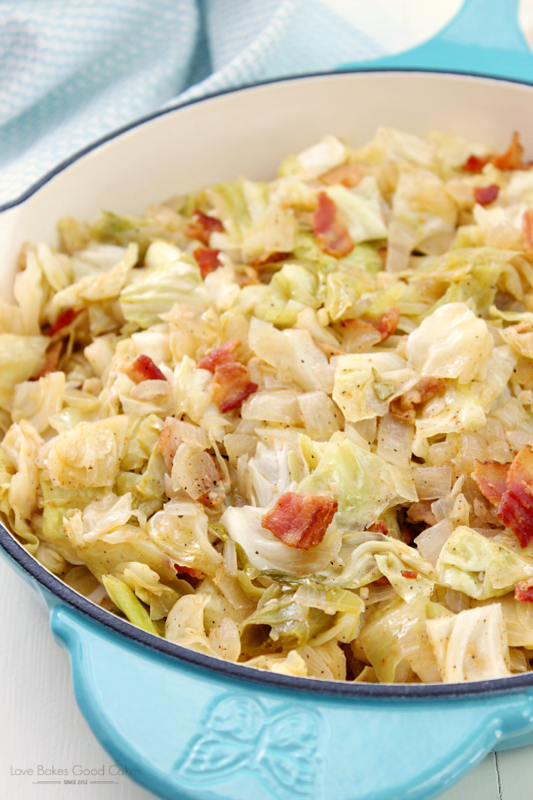 Bacon makes a great addition to cabbage. I like to fry bacon in my cast iron skillet. That fat keeps the skillet seasoned. 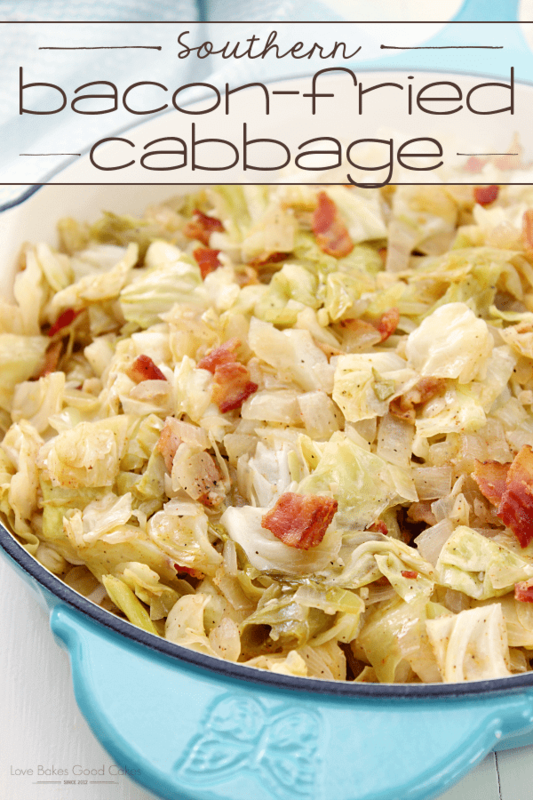 This is my kind of cabbage dish…fabulous flavors! with bacon. Add other ingredients as listed. meal.. Quick, easy and leftovers are a great plus. Been making this for years but add sliced smoked sausage and al-dente mini-farfalle. Makes for a very hearty meal. Sounds like a fabulous way of making a complete meal with the cabbage dish. Love that idea! Fried cabbage, hot buttered fried corn bread with blackberry jam on the side, fried taters and onions, sliced beefsteak tomatoes and vinegared cucumbers and onions, a skillet full of fried silver queen corn, with thick slices of jowl bacon slurped down with a couple of tall glasses of cold sweet tea! Dang, I miss my Mama! My mom made this my whole time growing up! Love that idea..right up to the corn (not my fav. veggie..lol) the rest of the veggies would make a great summer meal without heating up the house too much. My God !!! This sounds so good !!! I love cornbread with about anything . Born and raised on it …..But , this while thing sounded just like home …Only thing , it was sweet tea ! Didn’t eat the jam with it but sure would eat afterwards. Sure made me hungry . Think I will fix for supper ! 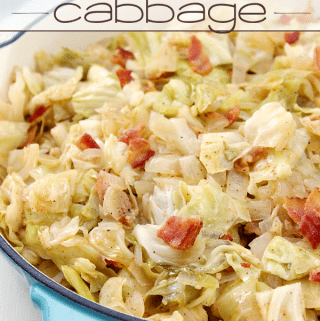 Fried cabbage is awesome also .Never tried with bacon .We had slab bacon .But , I’d eat it .Great recipe !!! And she made it all in the day before all of the shortcuts we have today. Women were amazing in those days! Grandma had 7 kids, no dishwasher, no microwave, no iron free clothing, no automatic washing machine, no dryer. Coffee was percolated, cornbread was in a cast iron skillet, jams were homemade. I don’t think grandma ever sat down for dinner, her job was making serving and cleaning up. What a woman. My favorite way of eating cabbage! Except I add a little butter to the bacon grease, more cabbage and sometimes the whole pkg of bacon!! Yum!! Same here! I can’t keep people off of it! My kids eat bowls of the stuff! I agree about the added butter….it makes a fabulous difference! OMGosh, what a perfect Keto dish! !Thank you! Bacon is the ultimate ingredient. I’m not a big fan of sweet potatoes or lima beans, but I would imagine that if Chef Alex or one of the other wonderful chefs from Food Network had a recipe that called for sweet potatoes or lima beans, it also had bacon in it, I’m sure that I would like it. Great recipe! I just don’t cook my cabbage that long because you loosr the vitamins and it gets very limp. Sounds so good I will be making it soon. II’ll toss in a couple chopped potatoes. 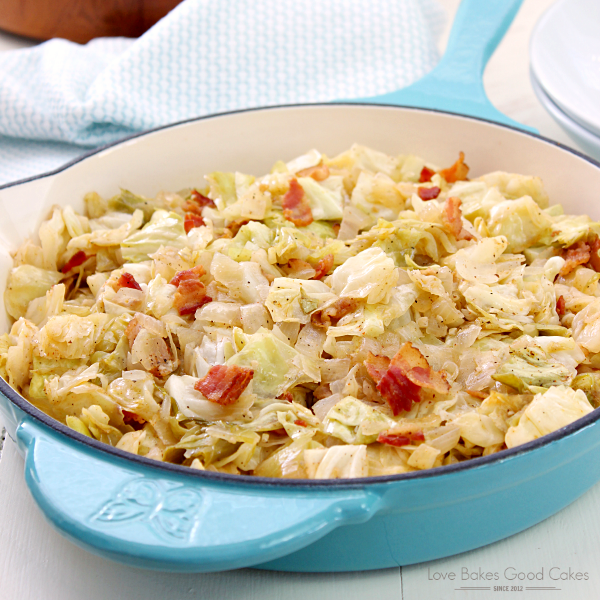 My daughter and I love this Cabbage and bacon recipe.! I only put in the pepper, bacon, onion and cabbage. Then not so much salt. Delicious! I made it with bacon and cabbage and didn’t add anything else to it. My daughter loves it. To this recipe I also add 1 beef Hillshire Farm type sausage sliced into rounds then quartered, browned with chopped onion – drain off fat. Add six small Yukon gold potatoes, sliced in half and par boiked. Lastly, a dash of dill weed. So so so good!!! and apples was my idea. Not much left. Great recipe except for one problem. All southern cooks know that you never discard bacon grease. In southern cooking it is like pure cold! All good cooks should have a jar of bacon grease in their fridge. How is this as a next day/leftover lunch? I add 1 T apple cider vinegar and 1 T brown sugar at the end of cooking. I love cabbage but didn’t particularly care for this recipe. I think I prefer it simply steamed by itself with a bit of butter, salt, and pepper. I add beef sausage to mine, it’s to die for! We eat it with sausage for a main dish. I made this just a couple days ago. Grew up on this. I add just a touch of tony’s. What wpuld be good sides or other dishes to go with this? Or is it a meal all its own? You’re missing the vinegar – very important part in my opinion. My preference is the rice vinegar or white balsamic, and love adding a pat of butter to the 1-2 tbsp reserved bacon grease for richness which is the “sauce”. I love this with panko-herb fried pork and boiled potatoes. Yum. 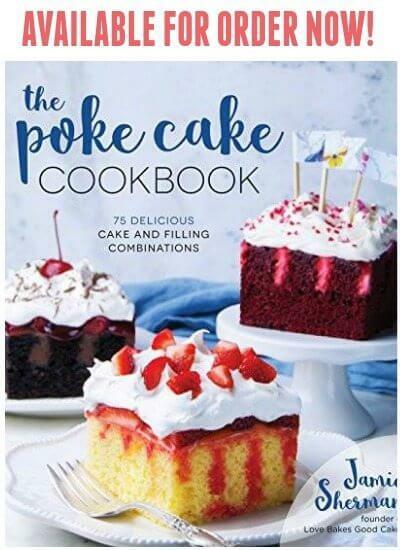 Ooh, now I need to run out to the store so I can make this tonight. I am a chef at a senior living community,they love bacon and of course cabbage they are going to love this dish, thanks for your recipe, enjoy your blog. Sounds absolutely wonderful!! I can’t wait to try it!! I made it, a couple of days ago, with sliced smoked sausage. Never had fried cabbage until after I married. It was the only way my husband would eat it. I cook the bacon just enough to get some of the grease, then add the onion and cabbage to the bacon, and then cover and cook together on low heat. Flavors are better to me than cooking them all separate. WONDERFUL RECIPE!!!! Thanks!!! Feel like I am in IRELAND!!!! This looks delish. I can’t wait to make some myself. I might even add some noodle to it. Mmmm, yum. Hi! I want to try this dish. Just wondering if I really need to cook the cabbage for 30 mins? Thanks!! Easy way to cook boiled cabbage? This is very close to a family favorite that my mom passed on to us girls, except we add a package of cooked extra wide egg noodles, YUM! was wonderful. I have printed it out, and we are having for dinner again tonight. Decided to fry red diced potatoes that added even more flavor. Did this with the onions. Wow! So delicious. I used turkey bacon and avocado oil and also a sprinkle of celery seed. Fabulous! Thanks. OMG!! This cabbage is the BOMB!! I will never fry cabbage any other way!! SO much flavor!! The core of the cabbage is the best part, cooked or raw in slaw. I went back to a cast iron set, what a difference. I also use a half of a bag of Amish egg noodles with this fried cabbage recipe. Can I ask why you use garlic powder and onion powder in addition to garlic and onion? Aren’t the onion and garlic enough? This is the way I make my Polish Halushki but of course I add wide cooked egg noodles to it. It’s not Halushki without them! My mother never used bacon but I found that I love the added flavor of bacon! Good recipe! The second time I made it, I reduced the onion to bring the carbs down and added about a tablespoon of nutritional yeast… made it even better. Yummy! Spice this up with a diced fresh red chilli, some grated ginger and a teaspoon of good vinegar! Yum! Add some sour cream on top. Kinda like a lazy cabbage roll dish. Wonder how this would taste using purple cabbage? I made this tonight. I omitted the garlic powder due to the 3 cloves of garlic you use. I also added 1 teaspoon of sugar as suggested by another person. My Seasoning Salt was the no salt seasoning of Mrs. Dash. This dish is so yummy! My husband and I loved it! 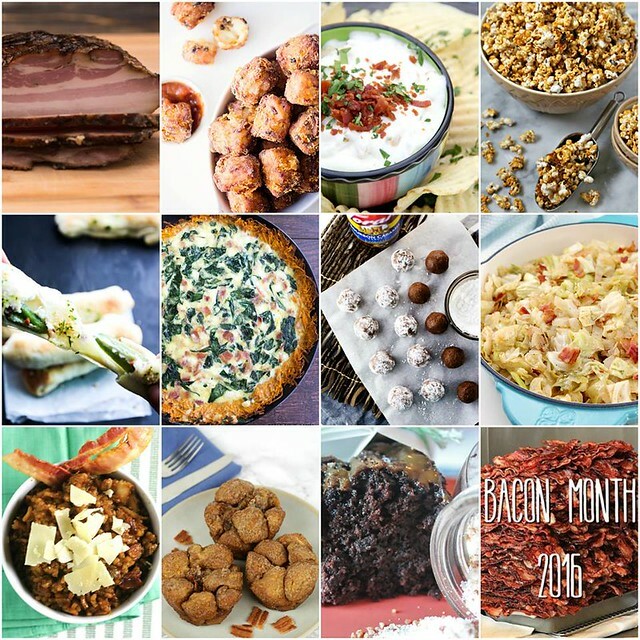 My son loved this recipe! THank you so much! This is haluski. Nothing southern about it. I take butter brown sugar & oions salute together. Add your fried bacon to this. Than add your cabbage . But I also add small shell noodles to this too. I don’t use onion powder or garlic for this recipe. Add to a batch of mashed potatoes and have colcannon. It is delicious. what a nice simpe recipe. i am sooo looking forward to trying this. I also add noodles to the cabbage and add chicken broth . My husband and I like this recipe.